THURSO SURF Expedition is a Touring inflatable paddle board designed for long range paddling. 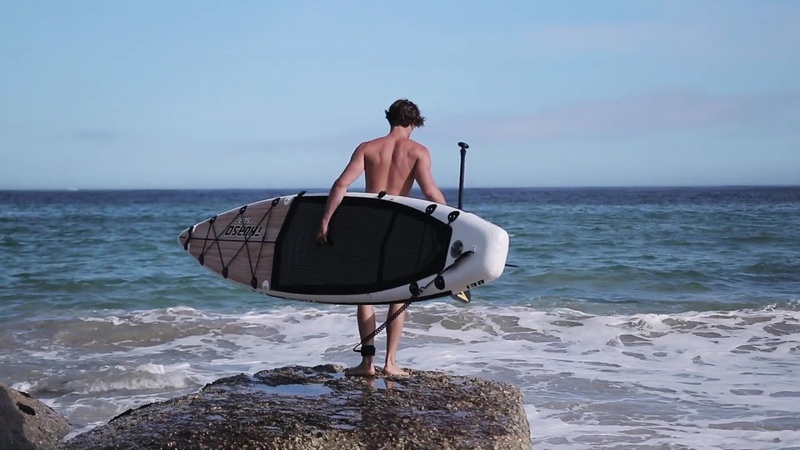 THURSO SURF EXPEDITION is a Touring inflatable paddle board created for speed. Its streamlined body is precisely contoured to minimize drag, allowing you to cut the water more easily and paddle further. The sharp nose and narrow tail grant the desired maneuverability for tight turns and full control. The overall design allows both paddling at speed and carrying supplies for an expedition. Perfect for paddlers who like to paddle fast and/or go on long/multiday trips. We wanted to enhance the EXPEDITION with a design to show our love and respect for Mother Nature and to make it beautiful. With that in mind we gave it a signature wood grain on its top. The wood graphic was scanned from real woods. We’ve used the most advanced printing techniques to print this on a PVC layer. The graphic looks absolutely authentic (and beautiful!). Unlike most boards, the THURSO SURF EXPEDITION features an all-new 4-point D-ring and bungee cord system at the tail, giving you extra storage space.